Last night’s ride was fantastic! Many thousands of people experienced a joyful ride through the city to celebrate 20 years of safe, social bicycle riding in San Francisco on the last Friday of each month. Thank you, everyone here and everyone on the street, for everything you did to facilitate the glorious bicycle blossoming in San Francisco last night. It’s like the years fell away and everything was and is alive again with possibility. Something happened over the past decade that deadened a sense of the possible and a sense of hope. After last night, it feels like there’s a quickening, something new sprouting. It feels like this is not just an anniversary but the birth of something new. Something we will remember in another 20 years. Maybe so. I hope so. Thank you for re-awakening this sense of the possible. It is difficult for me to overstate the importance of the Critical Mass movement to my life, which is probably why last night’s 20th anniversary ride was such an emotional moment for me. This movement has given me my career, many lifelong friends, my health, my sanity, hope, joy and damn near my life. Last night I got to see some of the same people I met for the first time in 1999 during my first visit to SF from Chicago. Yeah, it makes me feel old, but it also grants a sense of time – of adventures shared, work happily (and yes sometimes not so happily) done and many accomplishments both personal and professional. Part of a life worth living, to be sure. Happy Birthday SFCM and CCM! — withSuz Po and 16 others. This caused me to miss my 3 year old daughters birthday dinner. Thanks. I drive because it’s a 2+ hour each way by public transit, and ends up costing more than it does to drive. I do have to drive across downtown to get to where I can get on the freeway to get home. I work in SF because that’s where the jobs are, I live in a suburb because I can not afford to live in SF. 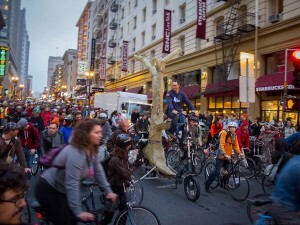 Anyways, I love critical mass, and think that public gatherings are a great thing (swing by the Burning Man building on 7th/market, there’s a block party there too tonight!). Love bike riders (wish BART would allow them on the train during rush hour as then I may be able to take public transit). Biking has improved the quality of life in the Bay Area, and if anything, a shift to biking makes traffic even less congested and easier for those who have no choice but to drive. And a happier city means merchants do better too! Both sides will have disrespectful people who hate the other. Cars who hate bikes, bikes who hate cars. I’ve seen video of bikes being thrown through car windows at CM, but I know that is the exception, not the rule. Thankfully, no car has plowed through and killed any bikers, and hopefully never will. Thanks for posting where it’ll end. Now that I know it’ll end towards Dolores, I can hang out near work and get some dinner or something for an hour, and I should have no problem driving down the Emarcadero around 7pm! Have a great ride tonight! One of these days, I may get to join on a ride! I am the director of an after school program in San Francisco for homeless and formerly homeless middle school students. Last month, in September, I was caught with a van load of kids for over an hour and a half at Market and Third. We take our kids on bike rides; I own two bikes and either ride or walk to work everyday. However, it was VERY frustrating to be stuck with some overwrought adolescents for so long while you did your thing. It meant that I worked a twelve hour day. It’s impossible to take the kids home by any means other than van since they live from Treasure Island to the Bay View to the Western Addition. I am really worried that the same thing will happen tonight, October 26th. It would be really helpful if you posted a map so I could find a route that would miss your ride. i like my bike very much.. it keeps me fit. Hello! I am going with three friends more to the Critical Mass this friday, 31th of May, 2013. I am from Madrid, Spain, we celebrate there the Bicicrítica, that is the name of our Criticall Mass. I am living now in US, but It is going to be my first criticall mass and my second day in San Francisco, because we will arrive tomorrow, thursday, do you have any idea about where can we rent bicycles in san francisco, close to the Justin Hernan Plaza, or do you know other way that we can borrow four bikes? We in Madrid, have a system to event like Criticona of Bicicritica, to share some bikes with foreign people, but I am not sure about that in San Francisco, because It is a huge city! I really appreciate any help or advice that you can give to us. I am not sure if you know where and about when finish, because we are not familiarize with the city.. Thank you very much for your helping!